Oxidative stress has shown to contribute in the mechanisms underlying apoptotic cell death occuring in AIDS-dementia complex. Here we investigated the role of peroxynitrite in apoptosis occurring in astroglial cells incubated with supernatants of HIV-infected human primary macrophages (M/M). Flow cytometric analysis (FACS) of human cultured astrocytes shortly incubated with HIV-1-infected M/M supernatants showed apoptotic cell death, an effect accompanied by pronounced staining for nitrotyrosine (footprint of peroxynitrite) and by abnormal formation of malondialdehyde (MDA). Pretreatment of astrocytes with the peroxynitrite decomposition catalyst FeTMPS antagonized HIV-related astrocytic apoptosis, MDA formation and nitrotyrosine staining. Taken together, our results suggest that inibition of peroxynitrite leads to protection against peroxidative stress accompanying HIV-related apoptosis of astrocytes. Overall results support the role of peroxynitrite in HIV-related programmed death of astrocytes and suggest the use of peroxynitrite decomposition catalyst to counteract HIV-1-related neurological disorders. Evidence exists suggesting that HIV-1-infected patients are under chronic oxidative stress [1, 2]. Major causes of the increased concentration of free radicals are: i) a depletion of protective systems (glutathione peroxidase, superoxide dismutase, vitamin E, selenium), and an increased production of free radicals (superoxide anion, hydroxyl radical) associated with the activation of lymphocytes and M/M; ii) chronic inflammation; iii) increased polyunsaturated fatty acid concentration and lipid peroxidation; iv) the direct or indirect effects of several opportunistic pathogens [1, 3]. 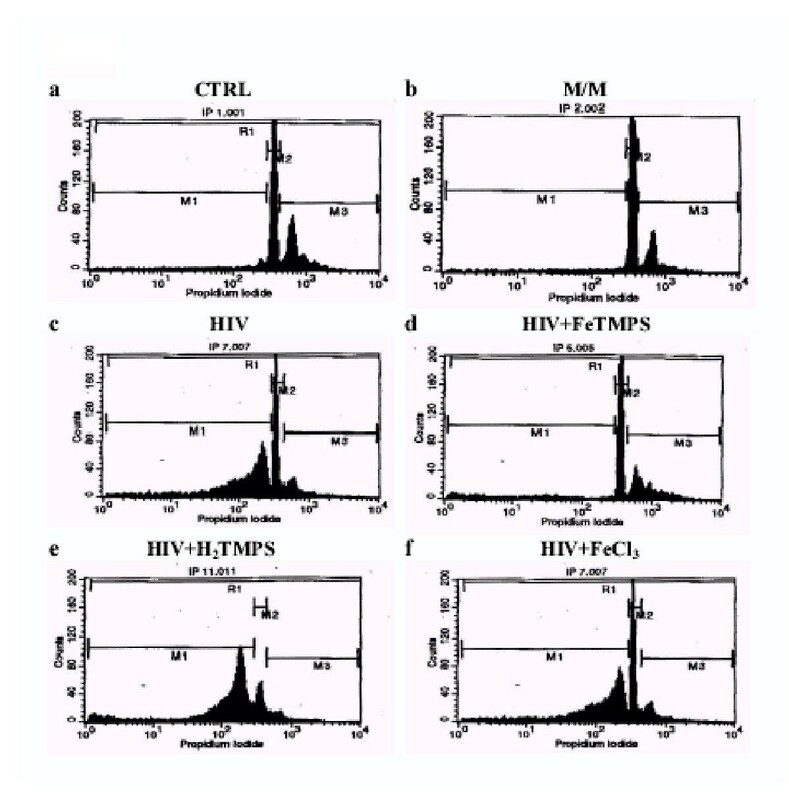 In addition, elevated serum levels of hydroperoxides and malondialdehyde, which are both indicative of oxidative stress, have also been found in asymptomatic HIV-1-infected patients early in the course of the disease . Despite the demonstrated role of free radicals in AIDS-dementia complex, the mechanism underlying HIV-related oxidative damage of CNS cells is still unknown. Recently, it has been shown that astroglial apoptosis play a key role in the neurological progression of HIV-1 associated dementia  and furthermore, incubation of astroglial cells with supernatants of HIV-infected macrophages leads to astrocytic oxidative stress and then to apoptotic cell death. This effect is attenuated by novel non peptidic superoxide dismutase mimetics, thus supporting that an abnormal generation of superoxide anions may contribute in HIV-related apoptosis [2, 3]. Evidence exists that HIV infetion is accompanied by simultaneous activation of free radical species in CNS cells other then superoxide anions, such as nitric oxide (NO). Since NO is able to combine with superoxide anions to generate peroxynitrite, a nitrogen free radical  accounted to produce relevant peroxidative HIV-related damage in CNS cells, it is likely that abnormal release of peroxynitrite may play a role in the apoptotic cell death which occurs when incubating astroglial cells with supernatants of HIV-infected M/M . The present experiments have been performed in order to evaluate the role of peroxynitrite in the apoptotic cell death of astroglial cells incubated with supernatants of HIV-1-infected M/M and ascertain the protective effect of FeTMPS, a novel peroxynitrite decomposition catalyst on HIV-1-related apoptosis of astroglial cells. Time-course studies revealed that astroglial cell apoptosis occurred between 6 and 8 days after addition of the supernatant from HIV-1 infected macrophages. Thus results will be shown at day 8. In particular, when astrocytes were incubated with supernatants of HIV-infected M/M, a dramatic reduction of cell viability was seen at day 8 by flow cytometric analysis (FACS). In sharp contrast, supernatants of mock-infected M/M only marginally affected astrocytes viability. The cytopathic effect observed in astrocytes exposed to HIV-1-infected M/M supernatants was mainly related to apoptosis. Indeed, FACS analysis showed apoptosis in 49% and 7% of astrocytes exposed to HIV-1-infected M/M or mock-infected cells, respectively (Fig. 1). Indeed, 121 nmol of MDA/mg protein of cell homogenate were found in astroglial cells at day 8 after exposure to HIV-1-infected M/M supernatants, with an increment of MDA production of about 9-fold compared to controls (Fig. 2). Neither apoptotic phenomena, nor MDA over production were generated after incubation of astroglial cells with supernatants from mock-infected M/M (Fig. 1 and 2). FeTMPS prevents apoptosis in astroglial cells induced by HIV-1-infected M/M. Supernatants from HIV-1 infected M/M (M/M + HIV) produces apoptotic cell death of astroglial cells (c) greater than supernatants from mock-infected (M/M) (b) as evaluated by FACS analysis 8 days after exposure to supernatants. FeTMPS (d), but not H2TMPS (e) or FeCl3 (f), antagonized this effect. When cells were treated with supernatants of HIV-1-infected M/M, a corresponding increase in the number of cells that stained with nitrotyrosine-specific mouse anti-serum was observed at day 2 (Fig. 3), indicating that an HIV-related peroxynitrite formation occurred in astroglial cells. No apoptosis was seen at day 2. Nitrotyrosine staining in astroglial cells either untreated (a) or pre-treated with supernatants of HIV-1-infected macrophages (b,c,d). In particular, the supernatant of HIV-infected macrophages enhanced the immunocytochemical expression of nitrotyrosine (b), indicating an increased production of peroxynitrite. Incubation of cells with FeTMPS (c) but not with the inactive catalyst H2TMPS (d) inhibited HIV-related peroxynitrite formation in astrocytes. 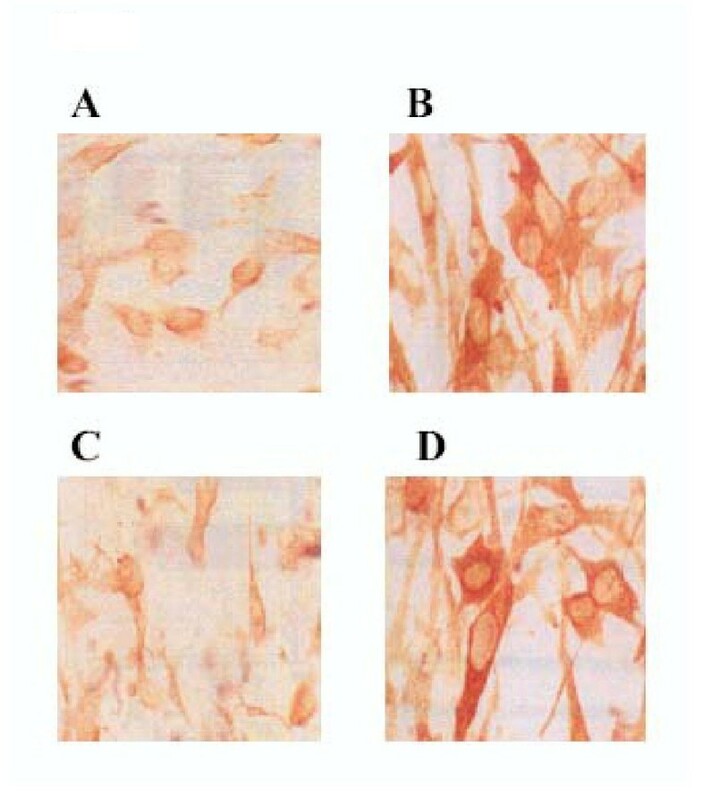 These are representative photomicrographs (optical microscopy 40×) out of four independent experiments. Dose responses with FeTMPS were performed (1–30 μM) and maximal effects were obtained between 10 and 30 μM. Results at the highest dose used are shown. Pretreatment of astrocytes with peroxynitrite decomposition catalyst FeTMPS strongly antagonized apoptosis induced by HIV-1-infected M/M supernatants. FeTMPS showed a potent dose-dependent effect as assesed by FACS analysis at day 8, only 10% of astroglial cells exposed to supernatants from HIV-1-infected M/M, and treated with 30 μM FeTMPS, showed signs of apoptosis, compared to 49% of untreated astrocytes similarly exposed to HIV-1-infected M/M supernatants (Fig. 1). In addition, MDA overproduction was significantly decreased by FeTMPS: 121 and 38 nmol MDA/mg protein of cell homogenate were measured in not-treated and FeTMPS-treated astroglial cell cultures respectively, at day 8 after the exposure to HIV-1-infected M/M supernatants (Fig. 2). In sharp contrast, treatment of astrocytes with H2TMPS (an inactive analogue compound of FeTMPS; 30 μM), or FeCl3 (30 μM) failed to prevent both apoptosis and MDA formation (Fig. 1 and 2). On the other hand, nitrotyrosine staining was decreased using the active catalyst FeTMPS (Fig. 3). FeTMPS did not affect, when incubated in the absence of M/M supernatants, viability of astroglial cells at concentration up to 50 μM (data not shown). The alteration of the homeostasis induced by HIV-1 infection, with consequent production of toxic factors, is claimed to be the main cause of neuronal damage during AIDS. In particular, the release of some coating component of HIV-1, such as gp120 glycoprotein or Tat, by HIV-1-infected M/M produces both direct and indirect effects in the central nervous system (CNS) [7–9]. Indeed, gp120, Tat and TNFα are capable to produce apoptotic cell death via cytokine release or caspase activation [10–13]. In vitro incubation of glial cells and neurons with gp120 or Tat leads to release of large amount of free radicals and, in turn, to neurodegenerative effects by activation of both cytokine network and excitatory amino acid NMDA receptor sensitization [14–17]. Previous studies have shown that HIV-1-infected M/M are able to induce apoptosis of T-lymphocytes or astroglial cells via overproduction of several factors, including prostaglandins, CD95-ligand, and free-radicals [18, 19]. Furthermore, arachidonic acid produced by infected M/M has been reported able to cause neuronal damage . 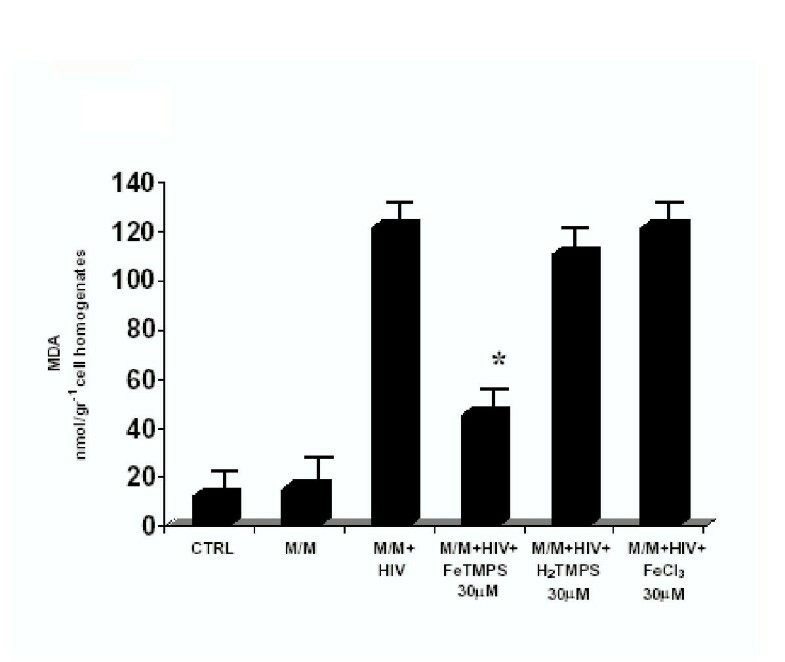 Finally, it has been shown that HIV-1 infection induces a heavy perturbation of oxidative status of M/M, including increased production of MDA, and decreased synthesis of endogenous glutathione  thus indicating that the interaction of HIV-1 with macrophages/microglial cells and the release of HIV-1 components into CNS represents apoptotic cell death of brain cells in neuroAIDS, via ROS overproduction. This is also shown by our experiments where we found that the HIV-supernatants-mediated apoptosis of astroglial cells was accompanied by an increased generation of free radicals, in particular of peroxynitrite, the reaction product of nitric oxide and superoxide . The role of peroxynitrite in our study was assessed by the use of the peroxynitrite decomposition catalyst, FeTMPS which catalytically decompose peroxynitrite to nitrate [21, 22]. In previous studies, FeTMPS but not H2TMPS (inactive analog)  was found to be protective against peroxynitrite-mediated damage in vitro as well as in several animals models of acute and chronic inflammation [23–26]. Importantly, FeTMPS does not interact with NO making it an important tool to assess peroxynitrite-mediated damage [23–25]. Our results suggest that overproduction of peroxynitrite, possibly via the release of pro-inflammatory substances by HIV infected macrophages/microglial cells, may contribute in the pathophysiological mechanisms underlying astroglial apoptotic cell death in neuro-AIDS. In addition, due to their innovative pharmacological profile, the use of novel non peptidyl peroxynitrite decomposition catalyst, such as FeTMPS, may represent the basis for alternative and efficient strategies in the treatment of neuroAIDS. Peripheral blood mononuclear cells (PBMCs) were obtained from the blood of healthy seronegative donors by separation over Ficoll-Hypaque gradient. After separation, PBMCs were seeded at a density of 6 × 106 cells/ml in 25 cm2 plastic flasks in RPMI 1640 with the addition of 50 U/ml penicillin, 50 μg/ml streptomycin, 2 mM L-glutamine, and 20% heat-inactivated, mycoplasma- and endotoxin-free fetal calf serum (FCS) (hereinafter called complete medium). Cells were incubated at 37°C in humidified air containing 5% CO2. After 5 days of culture, non-adherent cells were removed by repeated washing with warm medium. Macrophages obtained with this method resulted in >95% of purity analyzed by flow cytometry analysis. The astroglial cell line Lipari was derived from a 51-year old male patient who presented a large right front-temporal mass (astrocytoma) , these cells are not permissive to HIV-1 infection . Cells were expanded and cultured by seeding them in 25 cm2 plastic flasks at a density of 0.7 × 106 cells/flask in complete medium, and incubated at 37°C in humidified air containing 5% CO2. A monocytotropic strain of HIV-1, named HIV-1Ba-L, was used in all experiments. Characteristics and genomic sequence of this strain have been previously described [29, 30]. The virus was expanded in M/M, collected, filtered and stored at -80°C before use. Its concentration was 2.1 × 108 genomes, corresponding to 35 ng of p24 gag antigen (Ag), and 5,000 tissue culture infectious doses 50% per ml (TCID50/ml) as assessed by virus titration in M/M. Macrophages were challenged for 2 hours with 300 TCID50/ml of virus, then extensively washed with warm medium to remove the excess of virus, and finally cultured in complete medium at the same conditions as before. Macrophages were washed and fed every 7 days with fresh complete medium. Supernatants of HIV-1-infected and mock-infected M/M were collected at day 14 after virus challenge, spun to remove cells and cellular debris, and stored at -80°C until use. Virus production was determined by the antigen-capture assay using a commercially available p24 gag Ag kit (Abbott Pomezia, Italy). Astrocytes were incubated with supernatants from HIV-1-infected M/M or mock-infected M/M for 4 hours at 37°C in humidified incubator. FeTMPS (30 μM), H2TMPS (30 μM) or FeCl3 (30 μM) were added immediately before exposure to supernatants of HIV-1-infected or mock-infected M/M. Four hours later, cells were carefully and repeatedly washed (at least 5 times) to remove M/M supernatants, and cultured in complete medium with and without a daily treatment with all the compounds used in this study for the duration of the experiment (6–8 days). Astrocytes treated or not treated with supernatants of HIV-infected or mock-infected M/M were gently detached from plastic 6–8 days after virus challenge. Aliquots of 5 × 105 cells were centrifuged at 300 × g for 5 min; pellets were washed with PBS, placed on ice, and overlaid with 0.5 ml of a hypotonic fluorochrome solution containing 50 μg/ml propidium iodide, 0.1% sodium citrate, and 0.1% Triton X-100. After gentle resuspension in this solution, astrocytes were left at 4°C for 30 min, in the absence of light, before analysis. Propidium iodide-stained cells were analyzed with a FACScan Flow Cytometer (Becton Dickinson), fluorescence was measured between 565 and 605 nm. The data were acquired and analysed by the Lysis II program. MDA has been used as a biochemical marker for lipid peroxidation and was measured by a method previously described . In particular, levels of MDA were measured in astroglial cell homogenates 8 days after cell exposure to supernatants of HIV-infected M/M as indicated above. In particular, astroglial cells were frozen in liquid nitrogen, and homogenized in potassium chloride (1.15%). Chloroform (2 ml) was then added to each homogenate and then spun for 30 min. The organic layer of the sample was removed and dried under nitrogen gas and reconstituted with 100 μl of saline. MDA generation was evaluated by the assay of thiobarbituric acid (TBA)-reacting compounds. In particular, the addition of a solution of 20 μl of sodium dodecyl sulphate (SDS; 8.1%), 150 μl of 20% acetic acid solution (pH3.5), 150 μl of 0.8% TBA and 400 μl of distilled water, produced a chromogenic product which was extracted in n-butanol and pyridine. The organic layer was removed and MDA was read at 532 nm and expressed as nmol MDA/mg protein of cell homogenate. Immunocytochemical staining for nitrotyrosine was performed on treated or not treated astrocytes. Astrocytes were fixed with 4% paraformaldeyde dissolved in 0.1% phosphate buffer (pH 7.4). Nonspecific staining was blocked with 3% normal goat serum in 0.5 M Tris-HCl, pH 7.4 containing 0.2% Tween 20 for 1 h at room temperature. All subsequent incubations were carried out in this buffer. For detection of nitrotyrosine immunoreactivity, cells were incubated for 16 h at 4°C with an anti-nitrotyrosine monoclonal Ab (Cayman, 1:500) at 4°C. The primary Ab was then removed, and the cells were exposed to the secondary Ab, which was a biotinylated goat anti-mouse Ig (IgG), and avidin-biotin-horseradish peroxidase (VECTASTAIN Elite ABC Kit; Vector Laboratories), followed by diaminobenzedine. Statistical significance and standards deviations were assessed using the Student t test. Author 1 initials carried out the cytometric analysis, the immunocitochemistry, participated in the sequence alignment and drafted the manuscript. Author 2 partecipated in the design of the study and drafted the manuscript. Authors 3 initials carried out the biochemical analysis. Authors 4 and 5 initials partecipated in the sequence alignment. Author 6 performed the statistical analysis. Authors 7 and 8 conceived of the study. Author 9 initials carried out the virology study. Author 10 partecipated in the design of the study and in its coordination. This work was supported by Ministry of University and Scientific Research (MURST; COFIN 2000 and COFIN 2001), Italian National Council for Research (CNR), by the European Found for Regional Development (POP 94/99), by grants from the AIDS Project (ISS), Italy, by the Ricerca Corrente of the Italian Ministry of Health, and by Biomed Project of European Comunity. Our thanks go to Mrs Tania Guenci, and Mr. Giovanni Politi (University of Rome "Tor Vergata", Rome, Italy) for their excellent technical support.